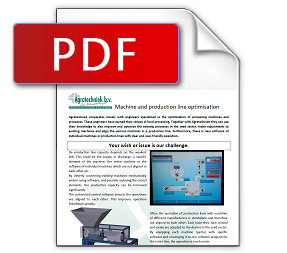 Agratechniek cooperates closely with engineers specialized in the optimization of processing machines and processes. These engineers have earned their stripes in food processing. Together with Agratechniek they can use their knowledge to also improve and optimize the existing processes in the seed sector; make adjustments to existing machines and align the various machines in a production line. 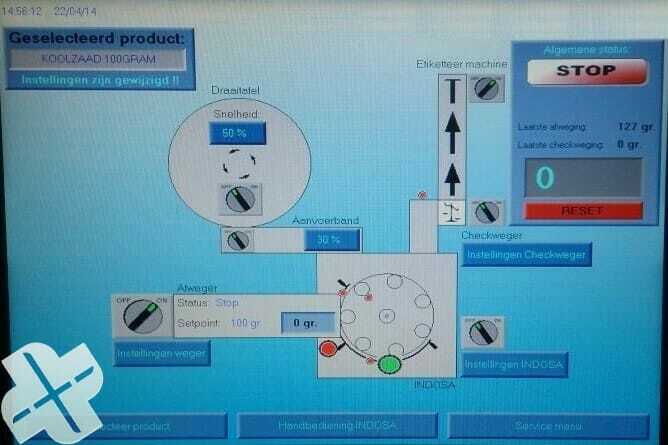 Furthermore, there is new software of individual machines or production lines with clear and user-friendly operation. Your wish or issue is our challenge. The production line capacity depends on the weakest link. This could be the supply or discharge, a specific element of the machine, the entire machine or the software of individual machines which are not aligned to each other etc. By cleverly connecting existing machines mechanically and/or using software, and possibly replacing the crucial elements, the production capacity can be increased significantly. The customized central software ensures the operations are aligned to each other. This improves operation friendliness greatly. Often the operation of production lines with machines of different manufacturers is standalone and therefore not aligned to each other. Each have their own control and rarely are adapted to the desires in the seed sector. 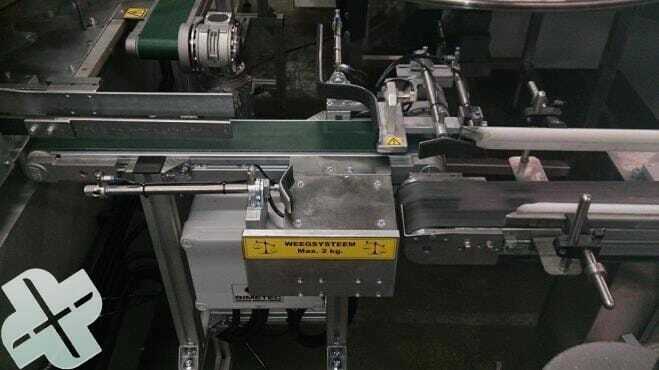 By equipping each machine (partly) with specific software and converging it to one software program for the entire line, the operation is much easier. Operation of the production line from 1 panel. 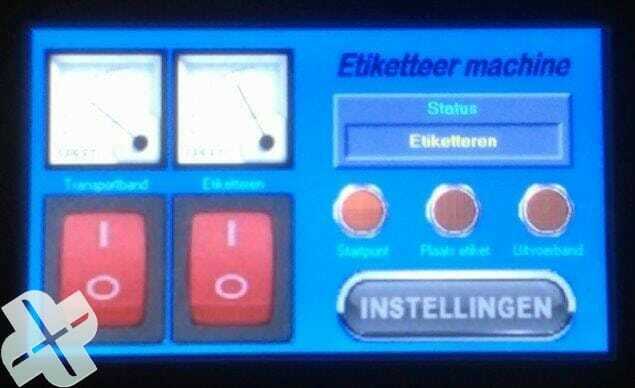 Optional control panels with several machines. Improved overview of the complete process. The replacement of improved pneumatics and mechanical components, can also improve the return on the machine greatly and adjust it to the current requirements. The canning machine, check weighing, labeling machine and packaging machine can be from different manufacturers. 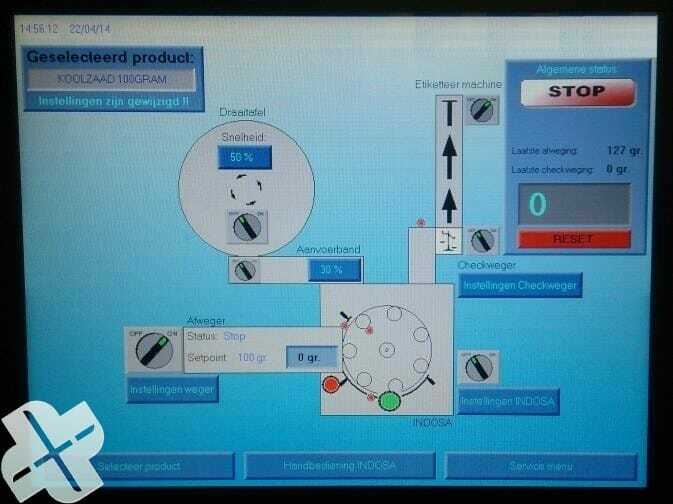 Right: In the new (central) software the operation of the labeling machine was simplified, which enables easy and fast setting of the label position. The check weighing has changed from belt weighing to static weighing: more accuracy and less sensitivity to failures. 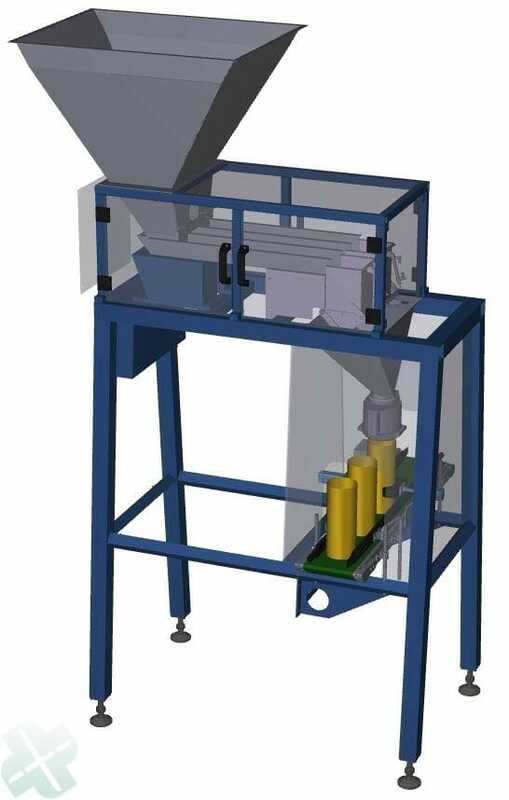 A self-developed weighing unit was implemented in an existing canning line for which the deviation was reduced to 1gr/kg of seed. The machines are supplied with new software which is aligned to each other. A clear central operation panel makes the entire process insightful. All settings can easily and clearly be configurated using a 12″ touch screen. The machines are supplied with new software which is aligned to each other. A clear central operation panel makes the entire process insightful. All settings can easily and clearly be configurated using a 12″ touch screen. 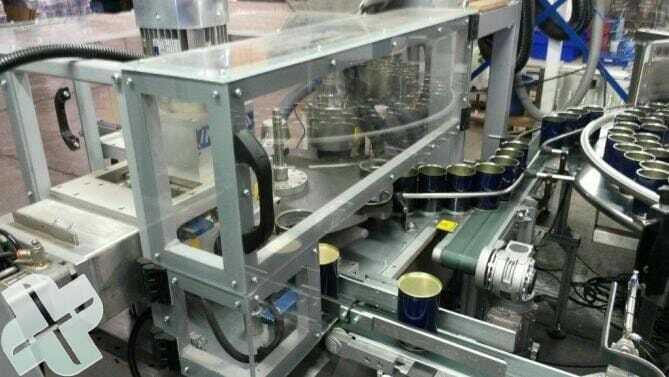 The can filling and seaming machine was equipped with new pneumatics and the existing line supply and discharge was optimized. Because everything has been aligned, the entire process is much calmer and with less risk of errors and failures. The capacity of the existing line has been increased from ca. 300 to 1000 cans per hour, by making relatively small adjustments. Almost every machine and production line can be improved greatly on a reasonable budget: higher capacity, more accuracy, more reliability, improved user friendliness and online direction and registration. Naturally ‘return-on-investment’ is an important objective. Our experts can give you an indication of the possibilities for your company. You can contact us for more information or to make an appointment.